Now in the Homeworld Remastered engine. We last talked about Homeworld 2's Complex mod back in 2012, and the ambitious enterprise has jumped up two whole numbers since then. 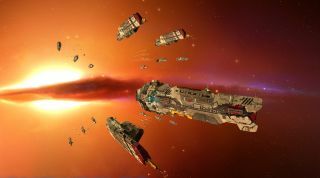 Now a modification for Homeworld Remastered rather than the original Homeworld 2, Complex adds many more intricacies to the business of multiplayer space battling, while finding room to include a new co-op campaign, lots of fresh assets, and other additions and tweaks to the Homeworld formula. Creator Bocchi started a successful Patreon campaign for Complex 10 around a year ago, and it was released just before the end of 2016, adding, among other things, playable Hiigaran and Vaygr factions and a "new multiplayer environment". You can download it here, although the file is listed as "archived" for some reason, so I'm guessing there's an update in the pipeline. YouTuber Dinky has a video series detailing Complex 10. I've put the first episode below.